Although the default layout of an inserted SmartArt graphic may looks perfect, you may also want to make changes to your graphic, such as adding more shapes, changing the text and colors. 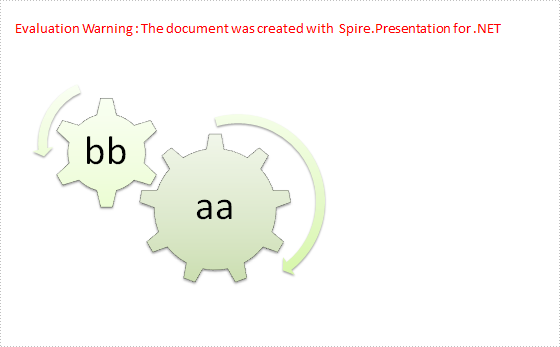 This article presents how to add a SmartArt graphic to slide and how to modify its elements programmatically using Spire.Presentation in C# and VB.NET. Step 1: Create a new PowerPoint document. 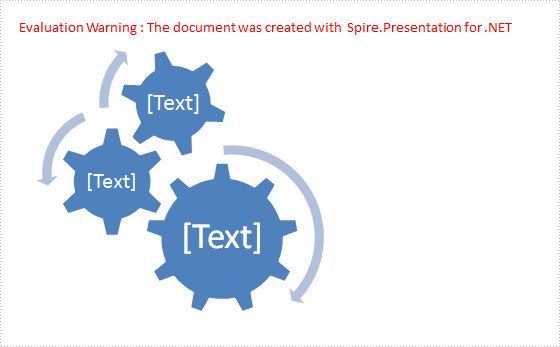 Step 2: Add a SmartArt to the first slide by calling the method Shapes.AppedSmartArt(float x, float y, float width, float height, Spire.Presentation.Diagrams.SmartArtLayoutType layoutType), here we set SmartArtLayoutTpye as Gear. Now, if we save the file, then we'll get the SmartArt as below. This is what the SmartArt looks like by default. Step 3: Design the SmartArt graphic by setting SmartArtStyleType as SubtleEffect, changing the SmartArtColorType to GradientLoopAccent3. SmartArtStyleType enum and SmartArtColorType enum contain almost all style types and color types that are enabled by MS PowerPoint. Step 4: Remove all shapes (nodes) in the SmartArt. In Spire.Presentation, each node represents a shape. Step 5: Add custom shape to SmartArt by AddNode(), the index  behind Nodes indicates the shape will be added in the first place, other shapes without index will be added in turn. Here we add two shapes to SmartArt with formatted text. Step 6: Save and launch the file. Here is what a customized SmartArt looks like. It is obvious that we have removed a shape, changed the shape color and changed the text and text color.